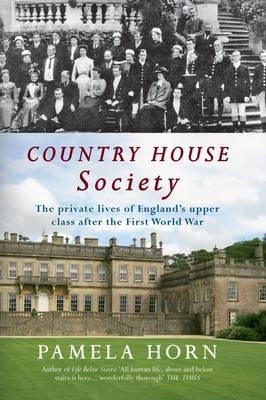 The late social historian Pamela Horn is in top form with her final release, Country House Society: The Private Lives of England’s Upper Class After the First World War. I own a number of Dr. Horn’s books, and prize them for her thoroughness, her compulsively readable prose, and her unerring ability to let primary sources (letters, diaries, memoirs, articles) speak through her writing. Country House Society is no different–in six lengthy chapters, Horn takes us through the swift changes to English high society in the wake of the Great War. In July 1921…in a leading article headed ‘Landowners Bled White’, Country Life examined a number of ‘typical’ estates selected from different parts of Scotland. In one case the figures showed that whereas parish and borough rates, land tax, heritor’s assessment, and other public and parochial burdens had amounted to £2,320 in 1911–12, by 1920–21 they had climbed to £4,838. The costs of management had similarly grown from £1,210 in 1911–12 to £1,677 in 1920–21, while renewals, repairs and improvements had risen from £3,069 at the earlier date to £4,983. Income tax had nearly quadrupled, from £636 in 1911–12 to £2,342 in 1920–21. No personal expenses, according to Country Life, were included in these figures. A very interesting section of the book deals with the General Strike of 1926, where young men arrived from Oxford and Cambridge and debutantes set aside their ballgowns to became “scabs” when 1.7 million workers in the transport and heavy industries set down their tools. The irony of how willing the aristocrats were to pitch in to keep the country running is that this very action further marginalized the working classes once the strike ended. Furthermore, beneath the “froth” of the chapters devoted to the London Season and other social pursuits, there lurked the frenetic melancholy and unease of both the Edwardians and their Bright Young Thing offspring that lingered from WWI. Horn does not fail to present a biting, yet balanced portrait of the hedonistic coterie of upper class men and women who took their fun a bit too far. Though Country House Society does discuss life in the 1930s, the focus is mostly on the 1920s, before the Wall Street Crash and the rise of Hitler made frivolity and selfishness appear in poor taste. Accompanying the text are 16 pages of fantastic photographs and period illustrations. This is book is of course perfect for Downton Abbey fans, but fans of British social history will love this book even more. I like Pamela Horn’s writing as well, but I have had to expand my comfort zone in history reading from 1850-1914 to 1850-1939. You mentioned one era that I know absolutely nothing about, the General Strike of 1926. Why would the upper classes take the jobs of struggling working families? To help the country or to destroy the working classes forver? Or was it self interest, assuming daddy owned the factories that were closed by the strikes? According to Horn, it was both a lark and a spot of patriotism. They had no idea their actions would hurt the working classes.